Notes: When we first begin knitting, we knitters tend to dole out the handknits to everyone we know and love, regardless of whether or not they want, need, or will appreciate said handknits. It’s not their fault when they don’t, of course; some people would prefer a different gift, and afterall, gifts are for the receiver, not the giver. On occasion, though, we realize that some people in our lives not only use, but truly appreciate the time, effort, and thought that goes into, a handcrafted gift. My friends R and J are those kinds of people, and they have thus received their fair share of gifts from me. They received my Baby Blue Belle before they were even ttc (these are two people who are destined to be the most incredible parents, so I knew this sweater would get lots of use and love some day); I planned my Modern(ist) Log Cabin around the colors in their new home for their wedding gift; I spent months knitting thoughts of comfort, healing, and hope into the Bridgewater Comfort Shawl last year when they were in pain. These gifts are appreciated and loved; I often see photos of them with the blanket in their living room or the shawl keeping one of their necks warm. These glimpses bring me such joy, and so, when I found out they were expecting what will undoubtedly be the luckiest of little boys, I knew I had to plan a handmade gift for him that would be personal and would make his mamas smile. The elephant is so named because my friend R is a silly silly person. She is the biggest elephant joke enthusiast I’ve ever encountered, and she has brightened many of my darker moods with a perfectly timed, superbly cheesy elephant joke. This little guy was fun to knit if a little fiddly, but seeing the shape emerge was worth the effort. He kills me with his cuteness, and I can’t wait to see the wee babe cuddling him. I’m pretty sure I messed up the crocheted ears, but meh, I bet the baby won’t notice. R and J have been referring to their lucky new boy simply as Rabbit River, as they’ve chosen to keep his name private until after his birth. 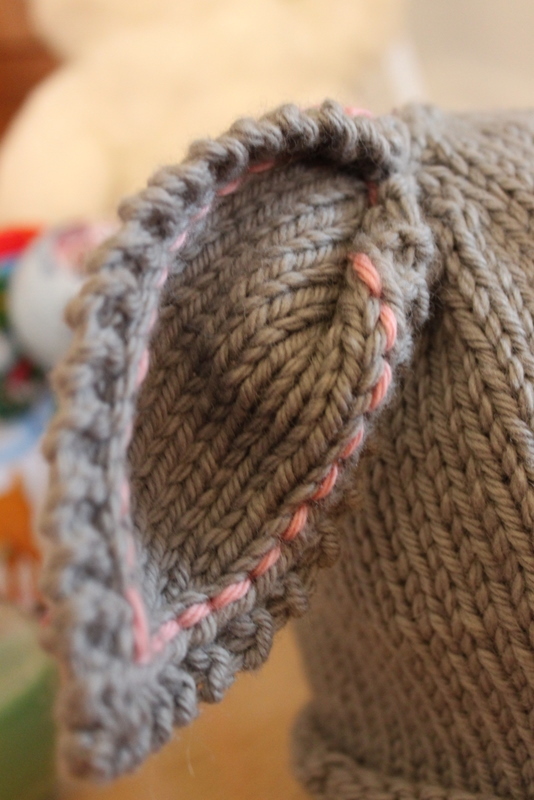 How could I knit him anything other than a rabbit hat? 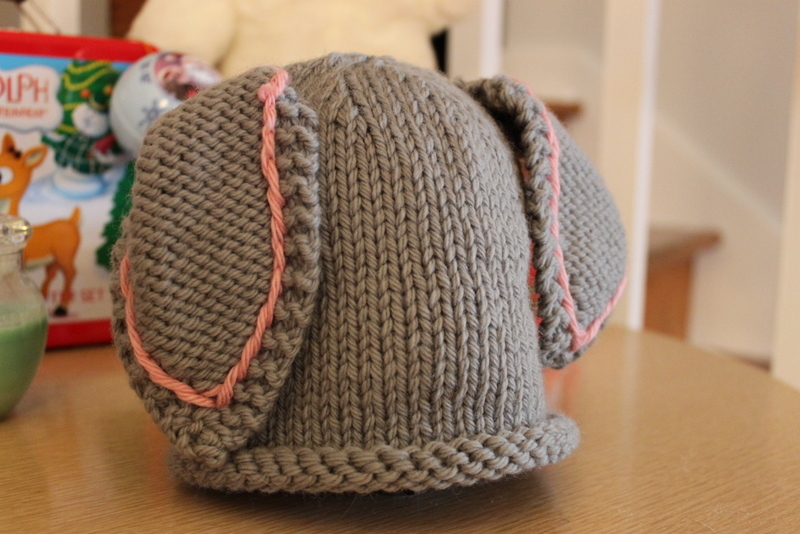 I followed the instructions for the hat, but then changed the ears completely, opting to keep them solid and simply chain stitch a little highlight pink on the inside edges. I’ll put details on my Ravelry page shortly. These gifts were, as always, knitted with love, and I have since received the sweetest thank you note from my dear friends, telling me what a part of their lives my handmade gifts have become. Could a knitter hope for anything more? I think not. What lovely, perfect gifts. People who appreciate hand-knits are the best ever. These seem to be just the thing to help welcome the little rabbit. Very cute knits and a great story to accompany them. Maybe orange didn’t get the raw end of the deal. Maybe it isn’t orange the colour but orange the fruit? Aw, those are wonderful, thoughtful handknit gifts. Both patterns are going on my to-knit list. Truer words abound gift knitting were never spoken. I’m glad to hear that the elephant and hat are going to a very, very good home. 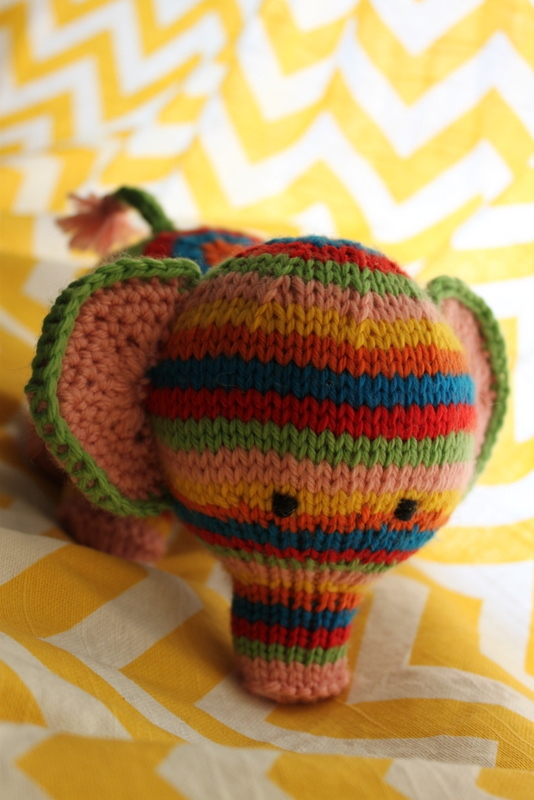 I love the stripy elephant! And that rabbit hat is pretty adorable. What are babies for if not to dress them up in costume hats? I think that baby might also need a strawberry and a chicken hat 🙂 It sounds like both items will be going to a home where they will be much appreciated. And that’s the best we can hope for as knitters. I hear you on the toys though… I just finished knitting a flamingo, and at one point had one stitch each on 3 DPNs, and was trying to balance them pyramid style as I knit… arrrrrghhhhh. What a wonderful story for some very adorable knits. Seeing handknits go to a good home is the best feeling in the world. I have a hard time imagining anyone wanting a NON-hand-knit gift when they could have something YOU made for them. The things you make are always so thoughtful, so perfectly suited to their occasion, so useful and practical and yet magical. Still, if narrowing down the hand-knit-receiving-pool has given you the time and love to create our gifts then screw those people. 😉 Seriously, though, the sweater you made us right before we started trying was the first hand-knit I’d ever been given. Ani has a new song about how something her partner said made her feel kissed. I think getting hand knits makes me feel hugged.